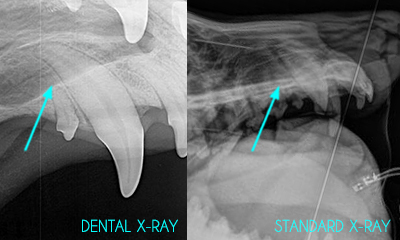 Dental X-ray is an essential tool in the diagnosis and treatment planning of oral conditions in your pet as 60% of the tooth lies under the gums. Digital dental X-ray system is used for superior image quality and it reduces radiation exposure to the patient. 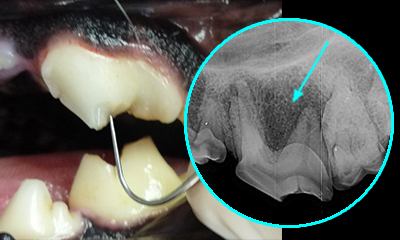 The canine tooth below illustrates how much more detail can be obtained with a dental X-ray vs. standard X-ray system. 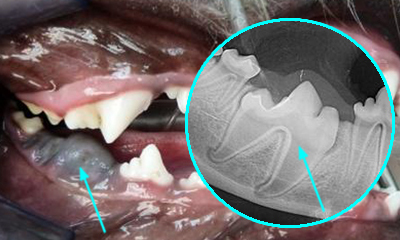 Dental X-Ray reveals a tooth root infection caused by a crown fracture. Dental X-Ray reveals impacted molar under the gum tissue. Dental X-Ray reveals that roots are still present under the gum tissue. Extra root or an abscess that has extended to an adjacent/normal looking tooth. Unerupted or impacted teeth, which can lead to a bone cyst. Teeth that must be extracted need to be evaluated for root fractures or root ankylosis (fusion to the bone). Also, post-extraction X-rays are the standard of care in dentistry. 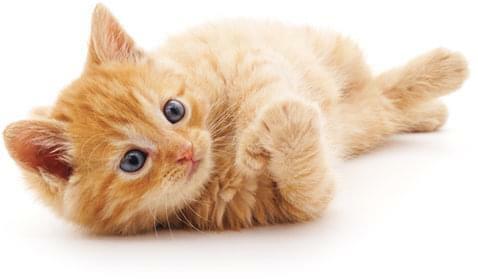 Cats are prone to “cavities” or resorptive lesions. 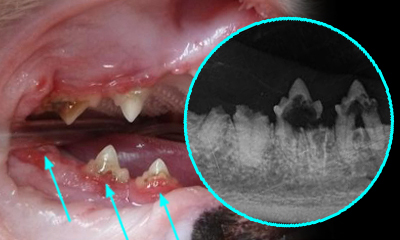 Some lesions are located under the gums and are only visible on X-rays. Treatment is based on the evaluation of root structure, where intact roots must be extracted, while resorbing roots can be retained. 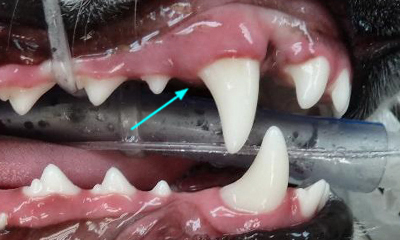 Oral growths (cyst, infection or tumor) require X-ray assessment for treatment or biopsy.